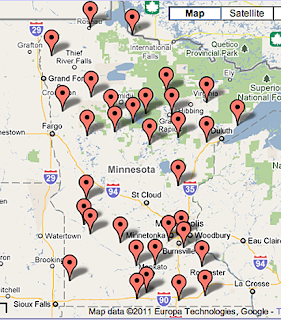 Minnesota has 33 USHCN stations, from Ada to Zumbrota and has three GISS stations listed, at Rochester, Duluth, and International Falls. 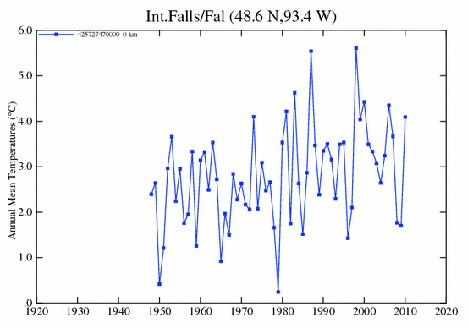 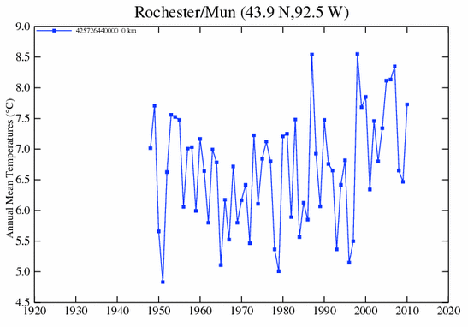 The historic record for the three GISS stations is, yet again, not complete over the time interval (1895 – 2010) of the USHCN record. 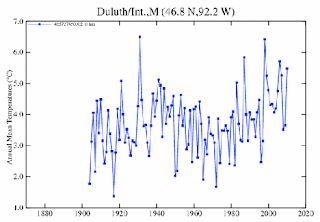 For example the temperature record for Duluth starts in 1904, while the other two only go back to the 1948 date that seems common to many GISS selections. 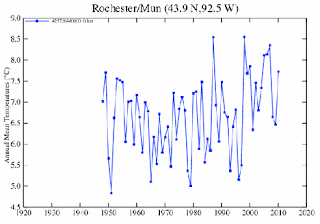 And the record for Rochester, MN also starts in 1948. 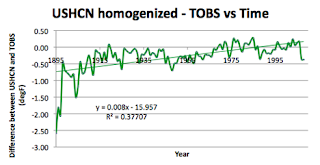 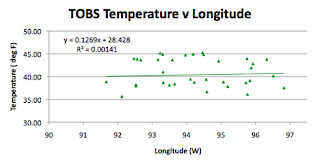 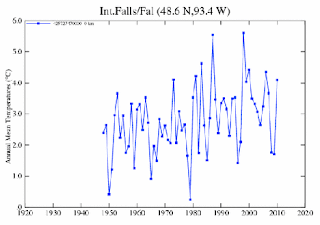 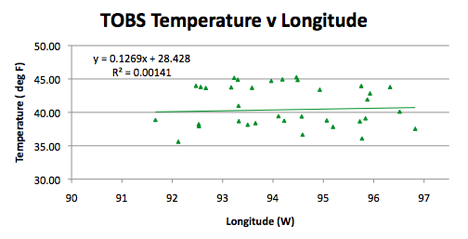 When the difference between the GISS station average and that of the homogenized USHCN data is plotted over the period it must be truncated since, for Minnesota, the GISS stations chosen do not record data pre-1904. 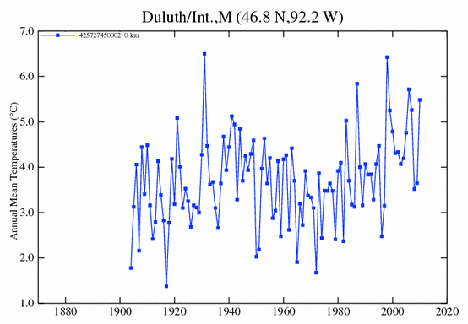 Average temperature for Minnesota in the period 1895 to 2009, using Time of Observation corrected temperatures. 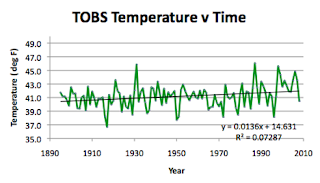 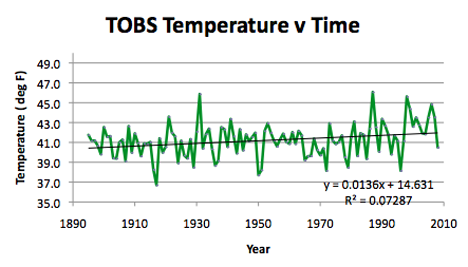 The rate of temperature increase for the state shows a 1.3 degree per century rise in temperature. 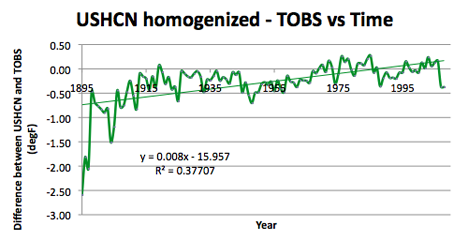 This is less than the 2.2 degree per century value obtained when the homogenized USHCN data is used. Minnesota measures 360 miles by 407 miles running from roughly 89.5 deg to 97.2 deg W, and 43.57 deg to 49.38 deg N. The highest point is at 701 m and the lowest at 183 m, with an average elevation of 366 m. The average USHCN station is at 349 m, and the average GISS station at 295 m.
In regard to Longitude, there is sensibly none. 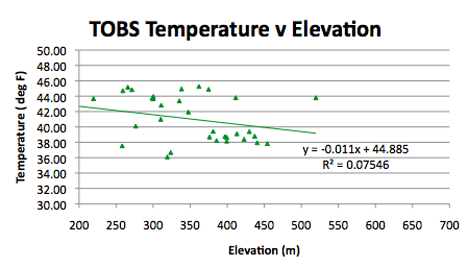 Turning to elevation, the correlation is not as good as it has been in other states, though evident. 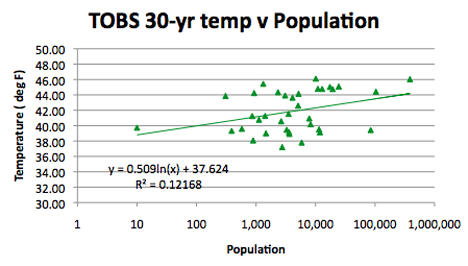 And then there is the correlation with population. 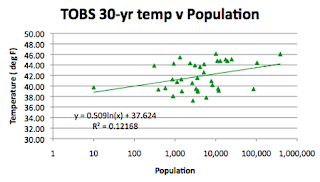 I am just using the average of the last 30-years temperatures to correlate with the population value – though should check I suppose to see which range of years gives the best correlation. 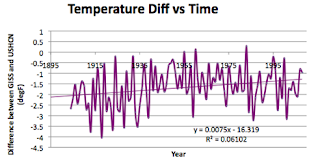 Certainly using only the shorter period (rather than the whole record) improves the regression coefficient from 0.03 to 0.12. 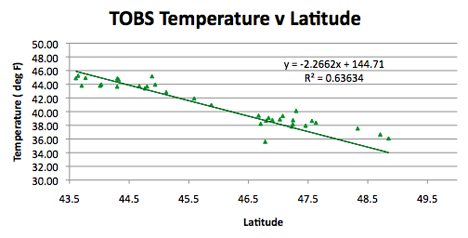 And yes, sadly, there is also this plot. 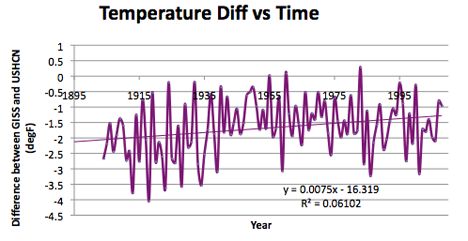 Super very useful article for all. Thank you for sharing.